It’s winter in New York City and the kid named Mark is busy hanging out at his friend Tim’s antique shop, cleaning out the ancient relics. Hidden in a nook behind some old books, Tim finds a small chest containing a glowing green stone. Tim decides to give it to Mark as a birthday present, much to the delight of Mark and his talking frog, C.J. Walking home, C.J. tells mark that the rock is the Dream Stone and it’s of great value. Venturing down an alley, they’re cornered by a gang leader and his buddy, Moe. The gang leader wants revenge against Mark for “acing” his kid brother and his buddy named Smooth. Powerless in the real world, Mark is about to get stomped when the Ninja Turtles leap down from the rooftops to save the day. They pound Moe and send him running, but the gang leader grabs Mark and puts a gun to his head. Don and Mike back off, but Leo and Raph stand their ground. In the chaos, Mark drops the Dream Stone and C.J. activates it. There’s a flash of light and Mark, C.J., the gang leader, Leo and Raph vanish. 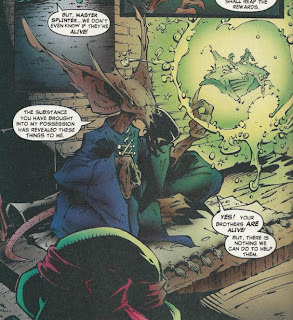 Don and Mike return to the sewers to deliver the troubling news to Splinter. 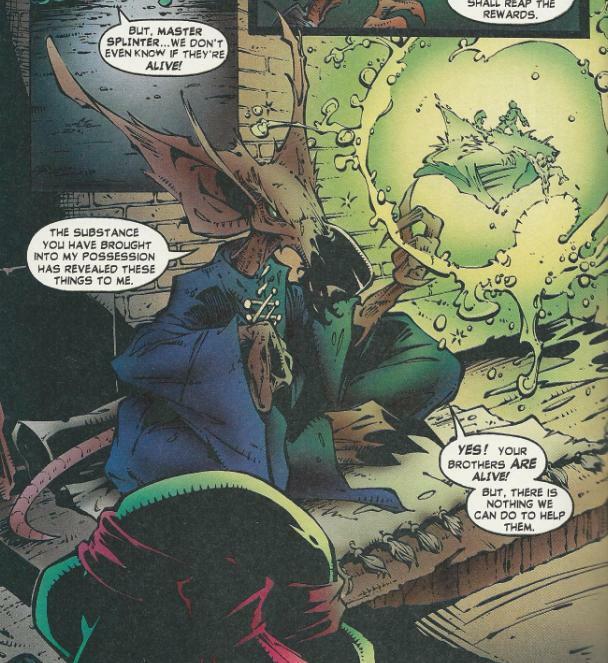 Being familiar with the Dreamworld and astral projection, Splinter conjures up an image of his wayward sons. He assures Don and Mike that Leo and Raph are fine, but that they will have to find their own way home. In the Dreamworld, the Turtles and Mark are stranded on a small island floating in space. The gang leader has been turned into a daisy and screams threats at Mark, who promptly kicks him off the island and to his doom. The Turtles and Mark start looking for a way off the island and Raph finds it, accidentally dropping through a hole in the ground. They’re met by a creature named Shrapnel, who has stolen the Dream Stone. Shrapnel unleashes a horde of demons on the Turtles and Mark. Now able to access his powers because he’s in the Dreamworld, Mark unsheathes his bone claws and prepares to attack. Leo and Raph beat him to all the excitement, though, and slaughter the demons. Leo slays Shrapnel and the villain drops the Dream Stone. 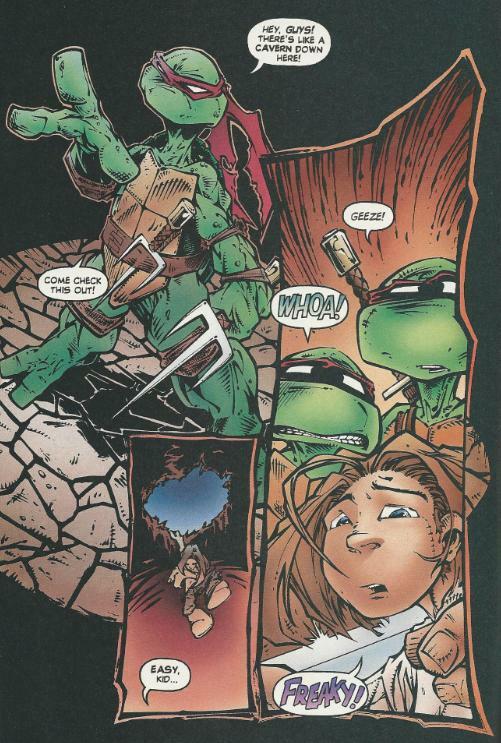 Mark picks it up and unintentionally activates it, sending Leo and Raph back where they came from. In the alleys of New York, Leo and Raph reunite with Don and Mike. They both agree that the kid they just met was really weird and vow never to speak of the encounter again. Back in the Dreamworl, C.J. hops out of the shadows and addresses Mark as “Creed”. He tells him that he fared well against Shrapnel and that he’s ready to learn more about their “association”. *From Creed’s continuity, this issue takes place after Creed #2 and the story continues in Creed: Cranial Disorder #1. *Mark “aced” the gang leader’s brother in Creed #1. *For whatever reason, this issue was excluded from IDW's Creed Omnichronos trade paperback collection (which claims to include, under no uncertain terms, EVERY Creed story). An odd exclusion, considering IDW currently holds the TMNT comic book license. Cyberfrog/Creed #1 was also omitted from the Omnichronos collection. *Creed/TMNT #1 was released with 7 variant covers: Cover 1A by Trent Kaniuga, Cover 1B by Peter Laird, Cover 1C by Trent Kaniuga polybagged with certificate, Cover 1C not ploybagged, Cover 1D same as Laird cover but signed and with certificate, Cover 1E platinum edition of Cover 1A, and Cover 1F hybrid edition available only to Lightning Comics subscribers. Wizard: The Guide to Comics was the only reason I even knew Creed existed back in the ‘90s. An issue came pollybagged with a free mini-poster and I had no idea who the kid with the silly hair was or what his comic was about. Kaniuga must’ve been pals with Gareb Shamus or something; he even throws in a shout-out to Wizard in one of the panels in the antique shop. As you can see, I’m not really a Creed fan. I don’t hold any ill will toward the thing, it just wasn’t a book I picked up back in the day and one I know next to nothing about. 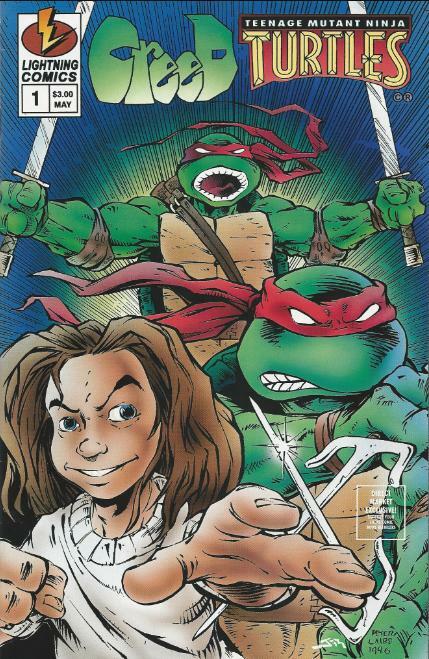 And that’s sort of a problem, as Creed/TMNT isn’t a one-shot that invites the uninitiated to follow along, but is really just the next chapter in the ongoing Creed saga with a special guest appearance by the Turtles. I had to use all the powers of Wikipedia at my command to figure who some of these characters were after I read this story. Usually, one-shots are the exact opposite. They’re standalone and allow enough leeway for fans of both franchises crossing over to follow along. If this had been Creed #4 I’d have switched gears before reading, because being dropped in the middle of a serialized plotline is to be expected in a case like that. But ah well. The Turtles are really superfluous to the events of this issue. Mark could’ve dropped the Dream Stone and been sent to the Dreamworld with or without the Turtles interfering. And he probably could’ve used his bone claws to fight the demons and Shrapnel without the Turtles, either. Hell, the way C.J. compliments Mark at the end of the issue, one would think that’s just what he did. The issue left me with the impression that the Turtles were merely included as a sales-boosting gimmick. Or maybe Kaniuga just really wanted to draw them. In regards to Kaniuga’s art, it took me a few pages to discern his “style”. When I first saw Mark, I thought Kaniuga had no concept of foreshortening or proportions because the kid’s hands were HUMONGOUS. After a few pages I realized that that’s just how Kaniuga draws Mark, with gigantic mitts, and quickly adapted to the style. At the very least, he remains consistent with such proportions, so I wouldn't really call it "bad", just... "unique". The hair, though, looks like a blatant aping of Joe Madureira’s style, which had a boat-load of imitators clogging the shelves throughout the ‘90s. 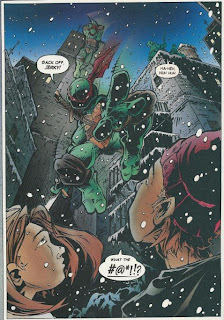 Anyway, Creed/TMNT #1 was a trip down ‘90s Nostalgia Lane, even if I only knew of Creed via reputation. It’s definitely a relic of the era, and depending on how fiercely you cling to the tastes of that particular decade, you can interpret that quality as either positive or negative. It seems to be a valuable chapter to the ongoing narrative of the Creed series (making its exclusion from the Omnichronos collection sound a little troubling), and that can be off-putting for those of us with no established knowledge of the characters or their universe. And I’m sorry to say, it didn’t really succeed in making me want to learn more about Creed, either. Someone on the now defunct Golden Age Cartoons forum (I think Mike Russo, a.k.a. "alleycat" or "DarthGonzo") once said he felt that the designs of the Muppets in the comics published by BOOM! Studios were so off-model he couldn't imagine the characters' voices coming out of their mouths. I disagree with that sentiment, but I think I feel that way about Kaniuga's depiction of Splinter. Also, Trent Kaniuga told me that CreeD: Cranial Disorder comes after this. 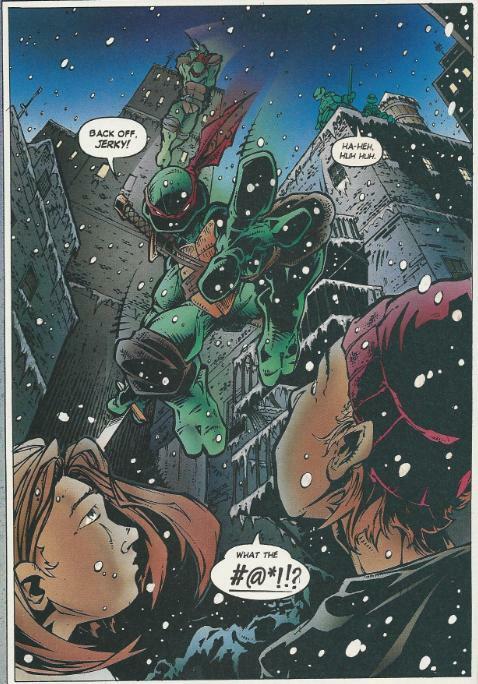 Did you notice Leonardo calls Raphael "Ralph" in one panel? Unrelated: Images of the new Rat King design for the Nicktoon have surfaced and oh holy Jeezus kill it with fire! I dunno, I'm kinda intrigued by that Splinter. He creeps me out in a similar way that Nicodemus did in the Don Bluth Secret of Nihm movie.